I had my old brunch / foodie friends back in town and they wanted to try someplace new. So I made them my guinea pigs since I had been wanting to check out Yolklore for some time. I was initially surprised at how small the kitschy restaurant was and I suppose they always have a line out the door on the weekends? The size doesn't seem to scare off too many people, but I did notice a lot of to-go orders. If nothing else, the time spent standing in line allowed us plenty of time to review the menu as there are some interesting unique dishes as well as plenty of typical breakfast items that can be ordered a la carte. I ordered the Seasonal Frittata (which came with a small fruit cup) and a side of potatoes. 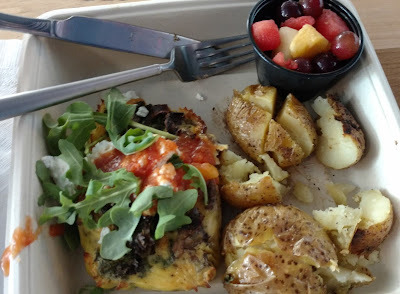 The frittata had cheese, mushrooms, creme fresh, tomato jam, and topped with arugula. This really hit the spot! 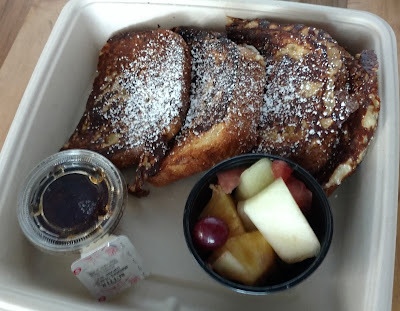 My friend Chris went traditional with the French Toast made with homemade brioche. 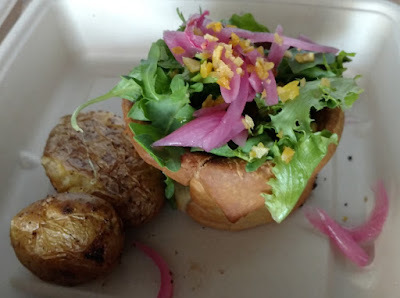 Anne was brave and tried the Nest Egg, one of their specialties, where two eggs are cooked inside of a biscuit crust with bacon bits, cheddar, and pickled red onion decorating the top. Unfortunately, the "nest" part was very hard to break into to get to the goods inside. Although I'm not a coffee drinker, I was impressed that they provided reasonably-priced coffee that you can help yourself to once you order. We were also lucky that a table for four opened up right as we got through the line, so be prepared to get a to-go order in case there are no places to sit. All items are served in recyclable trays that can easily be converted into a traveling container.